You already know that Twiggy Bridal offers the most unique, custom bridesmaid gifts. 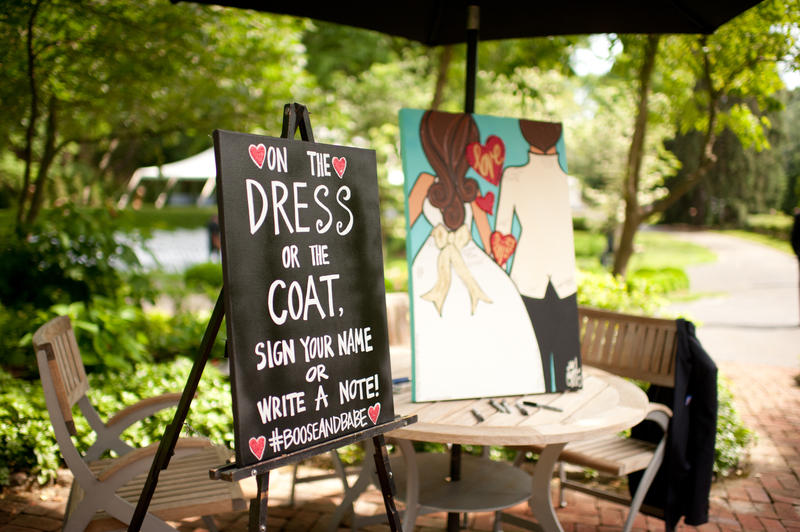 You can even order a custom portrait of the Bride + Groom decked out in their wedding attire to showcase at the reception, but did you know that Twiggy now offers the most unique alternative to the traditional guest book? My handsome groom wore an off-white tux jacket which made it easy for people to write in black, however, if your groom wears a darker color, I would recommend using silver or gold pens. Our painting is currently in our kitchen so, every morning as I wait for the coffee to brew, I get to read all of the sweet notes people wrote. It’s such a fun reminder of our very special day. 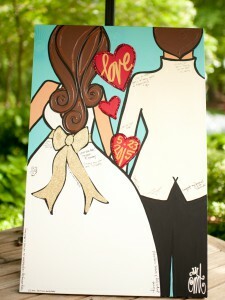 Prices for the Twiggy Guestbook Painting vary by size and start at $300. Contact Twiggy to order yours today or buy now! Adorable! How long does an order take to fulfill? Do you offer customized pieces? 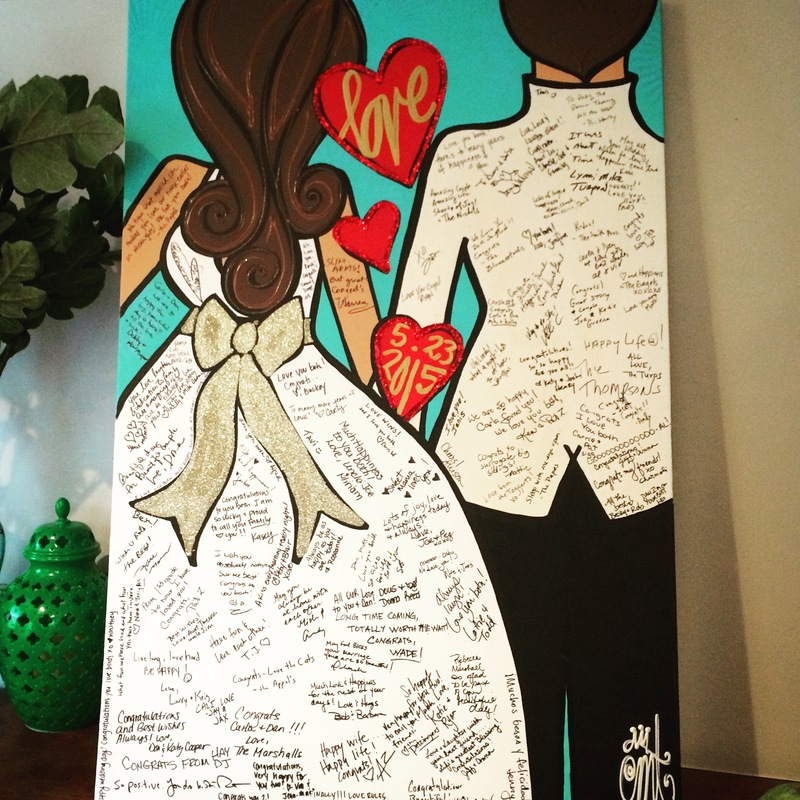 Is this the only wedding painting you do? Custom orders take anywhere from 2 weeks – 2 months depending on how large the order and I ABSOLUTELY create custom pieces. 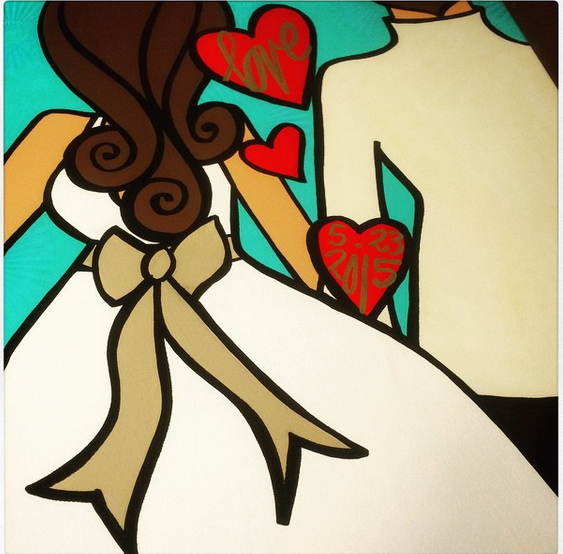 You can see more here: https://squareup.com/store/twiggy-originals OR you can visit Facebook.com/twiggy.originals and view the Twiggy Bridal album to see other paintings. I create custom bride + groom (groom + groom or bride + bride) paintings as well as custom bridesmaid paintings as gifts from the bride. The world is your oyster!! Hi! Are you able to do two african american brides? Maybe one with a dress and one with a suit? Love this idea! If you decide to order, you can have anywhere to 200 (although it would be tight) sign. I had 140 and it was tight, but enough for people to sign their names and some to write notes. It’s up to you. 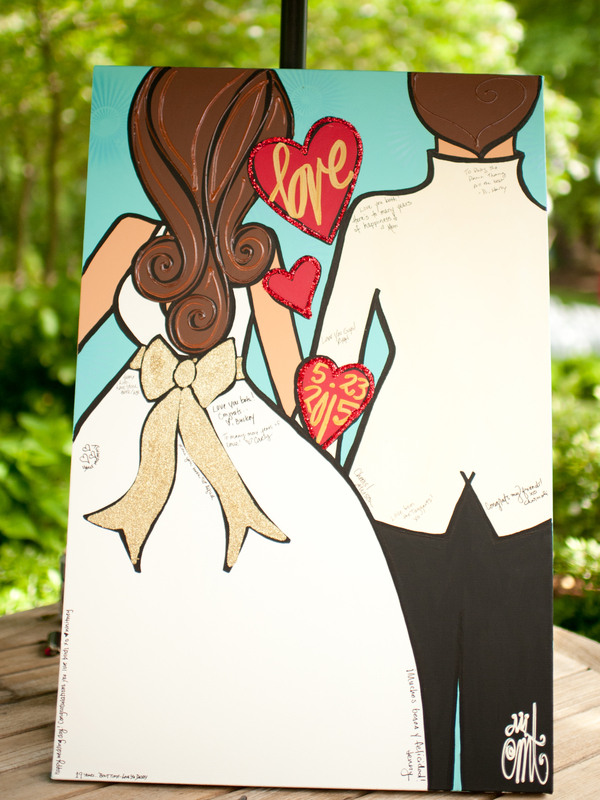 The 24×36 is the smallest size and I think it would be perfect and not too big to hang in your home. Hi Barb – I sent you an email with all the details! It will come from twiggy@twiggyoriginals.com. Thank you! 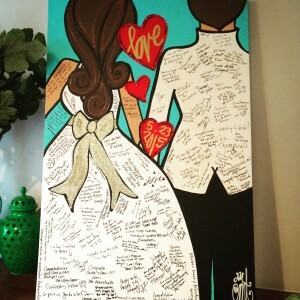 I love your paintings and am looking at getting a customised one to be the guestbook for my upcoming wedding this October. May I know how much you will charge and how long it will take for it to be shipped over and delivered? I am based in Singapore. Unfortunately, I do not ship to Singapore at this time. I SO wish I did though!! Hello, can the bride and grooms appearance be customized? Hi Lynsey – I just sent you an email with all the details. Let me know if you have any questions! Love it. I only have 60 guest. What would be the size and cost. Your awesome. Keep doing such a great job.